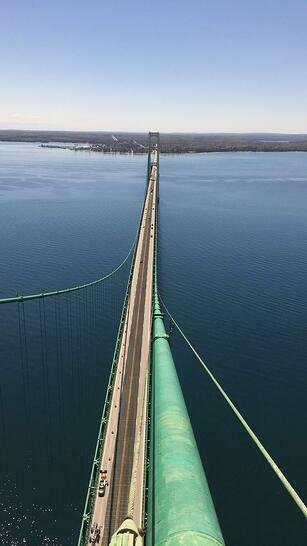 Michigan’s two peninsulas were finally connected in 1957, after 20 years of planning, and close to $100 million in construction and engineering costs with the construction of a bridge crossing the Straits of Mackinac. But the work didn’t stop there. Something this beautiful and majestic needs constant upkeep. This engineering marvel needs constant maintenance, cleaning and re-coating. In 2016, it was time for a major sandblast and painting. 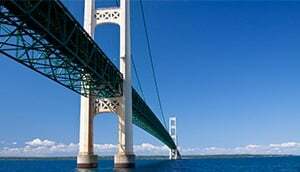 The Michigan Department of Transportation awarded a 2-year project to paint the north tower of the bridge to Seaway Painting Co. Inc. of Livonia Michigan. “We have been working on the Mackinac bridge on and off for more than 23 years”, states Seaway Painting CEO Steve Viahakis. Seaway Painting has a lot of experience working on bridges across the country, including the Ambassador Bridge in Detroit. Although they have worked on Mighty Mac for many years, this was the first time they are working on a full blast and re-coating of one of Mackinac’s towers. One of the benefits of being an underwriter is the opportunity to visit job sites. Old Republic Surety’s Tom Homer, Vice President of Underwriting, and our local underwriter Jake Huffman, Bond Manager for Old Republic Surety’s Grand Rapids Contract branch got an opportunity to see what few people do with a short trip to the top of the tower. “Climbing the tower was an adventure”, states Tom Homer. “The entry portal at road level is similar to a ship’s hatch and leads to a small elevator that three people can barely ride together. The elevator rose most of the way to the top of the tower, but we had to climb some ladders and exit through a portal at the top. It was a tight squeeze!” “We stayed for about 10 or 15 minutes and then headed back down. Climbing out on the deck at the top of the tower, I was a little shaky at first, but soon got my bearings. The project manager who brought us up said that the top of the tower is 350 feet above the roadway, which in turn is about 200 feet above the water. It was a beautiful day and not very windy, so the view was breathtaking. This was a once in a lifetime experience and one I will not soon forget”. Underwriting such a complex project was challenging in part because of a large bid spread. Zervos Group, the agent, was instrumental in facilitating the underwriting process which allowed Old Republic to support Seaway on this job. This included setting up meetings and gathering information necessary to underwrite the risk. There are a lot of unknowns in a project this robust. Seaway’s expertise on similar bridge projects and willingness to comply with underwriting conditions helped secure the bid. Seaway Painting has permanent crew housing close to the bridge and have developed a mobile scaffolding system to improve efficiency. Crews of 8 to 10 work together, balancing on the scaffolding above the Straits. It’s windy, cold and wet much of the time, but the Seaway crew works in all types of weather. It takes a special kind of person to climb to that height in those kinds of conditions. “The view was spectacular”, says Jacob, “truly a once in a lifetime experience”. The north tower sandblast and re-coating project will near completion in the Fall of 2018. The South tower of the bridge comes out for bid in October, 2018 and Seaway intends to bid that project as well with the support of Old Republic Surety.